Cynwyl Elfed village is located approximately 7 miles north of Carmarthen on the A484 towards Cardigan. There is a school, chapel, and a church which is famous for its east window depicting Christ on the cross showing five wounds. There is also a local inn 'The Blue Bell' and a working woollen mill known as Elvet Woollen Mill. The hall is a converted school which was modernised 5 years ago and is capable of seating approximately 120 people in the main hall and up to 30 in the meeting room. "Canolfan Gymdeithasol Cynwyl Elfed Community Centre" is a registered charity No. 1096174 and a limited company No. 4517004. ADDRESS Surgeon Street, Cynwyl Elfed, Carmarthen, SA33 6TR. Stage, Kitchen, Loop Sound System, Heating. 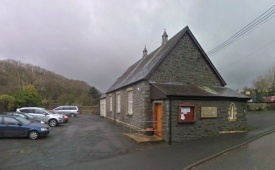 The hall is situated centrally in the village on the B4333 road towards Hermon and Newcastle Emlyn.